Nuclear energy is something many people have heard of and many have strong opinions on, but few understand how it actually works. 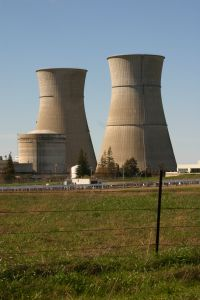 This section looks to remedy that and explain why a website dedicated to sustainability is proposing nuclear energy as one of the major things that needs to be done. Nuclear energy, similar to coal or natural gas, relies on creating heat to turn water into steam and use that steam to turn turbines. There are a number of steps to get to this point, including construction, mining and purifying, reacting, making electricity, and disposal. You can read a quick overview of how this works below. First off, a nuclear power plant must be built. This may seem like a self-explanatory step hardly worth mentioning, but as you'll learn later in the section, it is quite an important step. These reactors need a number of safety precautions built in and require a bit more than the equivalent of a big oven that is used in coal plants for making heat. For example, among other things, the reactors must be built with heavy concrete shields surrounding where the reactions that create the heat for electricity actually occur. Second, nuclear energy involves the mining and purification of Uranium ore, the feedstock for the nuclear reactor. Not only does this Uranium need to be mined, but a particular type of Uranium that is useful in nuclear reactions must be found. This type of Uranium, called Uranium 235, accounts for only 0.7% of all naturally occurring Uranium. Next, that Uranium must go through a nuclear reaction at the power plant that splits the Uranium into two smaller elements and a lot of energy. This chain reaction occurs as long as those operating the plant tell it to until all of the Uranium has been broken down. The energy that is produced is heat that is used to turn water into steam, which then turns a turbine, creating electricity. The last step is the one that probably receives the most attention and that is the disposal of the spent Uranium feedstock. This nuclear waste must be disposed of somewhere. The fact that the process of creating nuclear energy uses up a natural resource and produces waste during its operation means that nuclear is not a renewable energy source, but it is a clean energy source, which is why it's featured on this website.